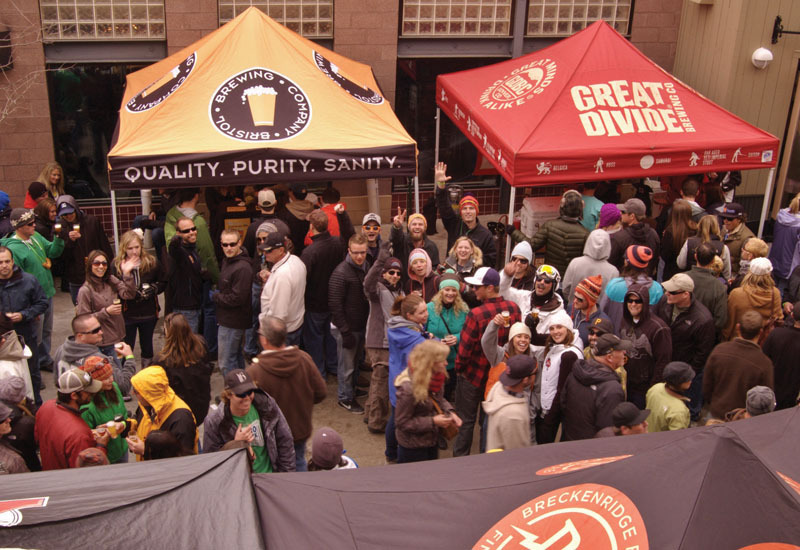 Beer fans, if you haven’t already, start marking your calendars now for the seventh-annual Breckenridge Beer Fest. If you’ve enjoyed it in the past, then you’re in for a treat because this year it’s moved to a bigger location, which means more breweries, more beer and more fun. Last year’s spring event drew in somewhere around 3,000 people – 2,000 for the tastings and between 1,000 and 1,500 just for the fun of it. While in previous years the event was held at Main Street Station, this year it will go down along the 100 block of Ridge Street, allowing for more tents and better crowd flow. While that event had 23 different breweries, this year features 32 in total. Of these, 23 are from Colorado, including Summit County’s own Breckenridge Brewery and Pug Ryan’s Steak House and Brewery. Other states represented include Alaska, Missouri, Illinois and Hawaii. The farthest-traveled award will most likely go to Sapporo, which hails from Japan. What’s more exciting is that’s not all the breweries that wanted to come. According to event director Jen Radeug, the festival has a waiting list, meaning breweries are recognizing that Breck’s a great place for beer. Jimmy Walker, head brewer at the Breckenridge Brewery, is eagerly looking forward to the festival. “I’m ecstatic about the new location,” he said, hoping that the new layout will make it easier for him to get around and taste all the other beers. He’s also working on planning out what brews his tent will be offering. There will be a sampling of the usual lineup, of course, but that won’t be all of it. This is for the locals, he said, who are familiar with the usual and are looking for something extra and fun for the festival. Two of these could be a keg of bourbon barrel-aged bock (Pandora’s Bock) or his latest roasted habanero IPA. In addition to beer, there will be plenty to snack on at the festival, with food from nearby Ridge Street businesses such as Fatty’s Pizzeria, Hearthstone Restaurant, Twist, Moe’s Original BBQ, Cuppa Joe, Angel’s Hollow and South Ridge Seafood Grill. There will be plenty more vendors, including the obligatory pretzel necklaces, provided by the Breckenridge Rotary Club. Once thirst and hunger are taken care of, there’s food for the ears and the soul, as well. The music venue includes headliner 7Horse, with Max Gomez as the opener. “We usually try to bring in up-and-coming indie bands – the ones that you may have heard of if you really love music, but if you haven’t, you’ll be hearing them a lot in the next few years,” Radeug said. Though the event is bigger, with more breweries and vendors this year, ticket prices remain the same. Unlimited beer tasting is $30, or $25 in advance. VIP tasting includes a large commemorative stein, private beer tasting in the VIP room and a catered lunch for $75, or $65 in advance. Tickets can be purchased at http://www.breckenridgebeerfestival.com. The event runs from noon to 5 p.m. Saturday.